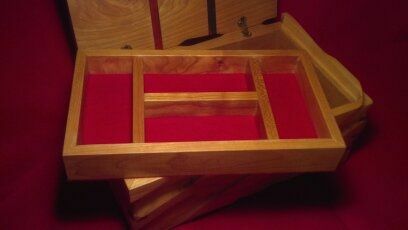 This cherry jewelry box starts as a simple square boring box. 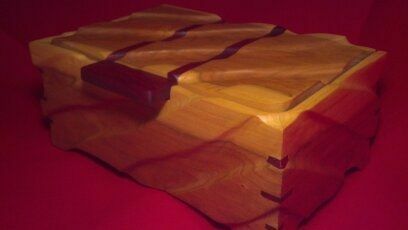 I make up the design of the box as I go, I usually base the design off of the way the wood looks and feels. 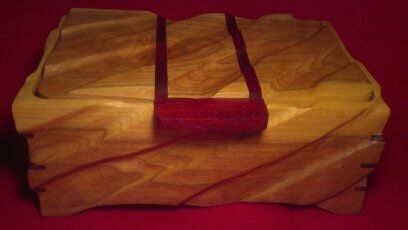 With this particular box, I added an exotic African wood called, Padauk, which blends well with the cherry wood. When I finish constructing the box, I sculpt the box by hand with a wood grinder. 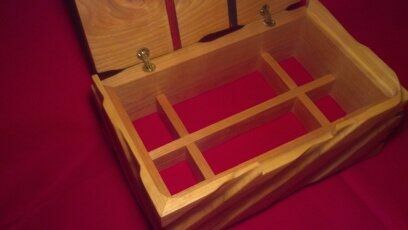 To finish it off, I coat the entire box with 5 coats of danish oil. Then I finish the interior off with red felt. The lid is hinged with hidden from the outside, brass barrel hinges. Each box is made unique and is one of a kind. The finished size of the box is 4 3/4" tall, 7" deep, and 11" wide.